One day I was mooching around in Dublin (it was my birthday, I was allowed to mooch) and I found an angel. I didn’t just find an angel, as it turned out. I found a whole world. A new story. 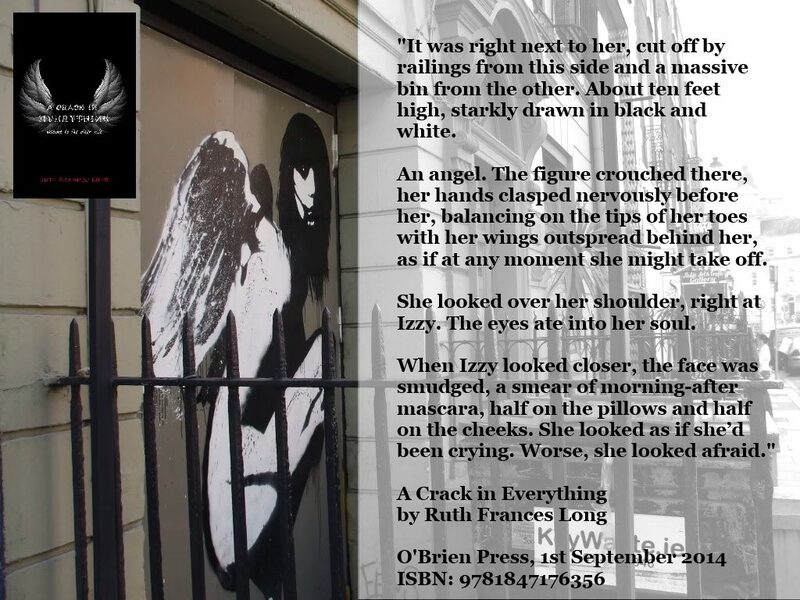 Halfway down South William Street, painted on doors leading to an alleyway or loading area, was the black and white graffiti angel which inspired everything about A Crack in Everything and the world of Dubh Linn. She was beautiful, mysterious, with the sense of the Mona Lisa about her. Her eyes followed you as you walked by. No one seemed to know who had painted her there. And now, of course, as is the nature of all fae and ephemeral things, she is gone. Painted over. For a while the doors led to a nightclub which was also fitting, as the angel leads Izzy to Silver’s Hollow, a fae nightclub deep within the parallel dimension which holds the city of Dubh Linn. But now, this appears to be gone as well. What will arrive there next? Anyone’s guess. I for one can’t wait to find out. I’m told the angel herself can be found in a bar up the road, overseeing us all but I haven’t gone to look. I recently found her, in a much smaller form, in a coffee shop all the way out in Dalkey. She’s keeping an eye on me. I don’t know if that’s good or bad. Writing about Dublin takes you down the streets broad and narrow of Molly Malone, the wide Georgian avenues of the 18th century reconstruction of Dublin, when the Wide Street Commission (or more properly Commissioners for making Wide and Convenient Ways, Streets and Passages in the City of Dublin) was established by an Act of Parliament to purchase, demolish and rebuild the city centre, and the narrow lanes of Viking and medieval Dublin which survived. We follow these twisting pathways back to the origins of the city and back over a thousand years. The original Dubh Linn, the Black Pool, of Viking Dublin can still be found in the heart of the city. It’s surrounded by the castle walls and is now a park, with elaborate paths twisting across it representing the eels which once inhabited the pool. 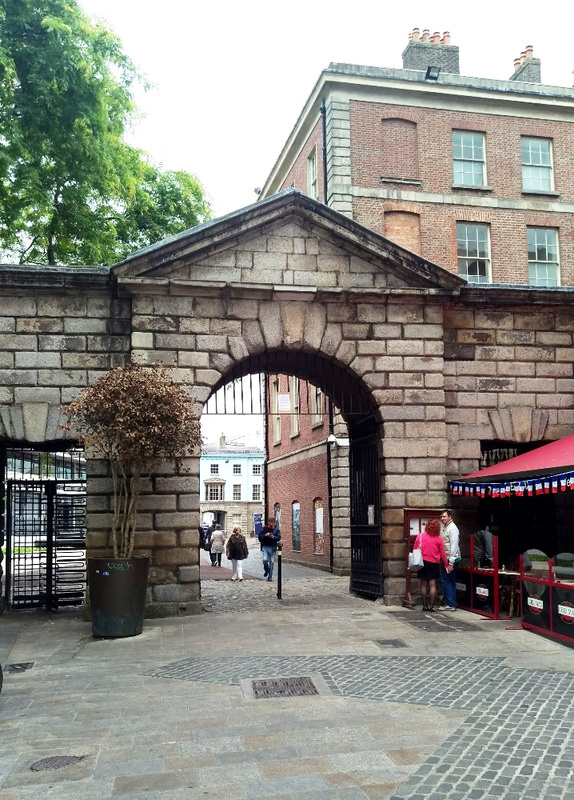 It’s right beside the wonderful Chester Beatty library, and overlooked by the medieval tower and the Chapel Royal, along with an array of building from every era which crowd into the interior of the castle. In many ways, it doesn’t look like a castle, but rather more like a hodge-podge of buildings gathered together over time. The Chester Beatty library is one of the most interesting museums in the city, once a private collection of books, manuscripts and oddities from all over the world, gifted to the State. It’s free to visit, has an amazing roof garden, and a splendid restaurant and gift shop. 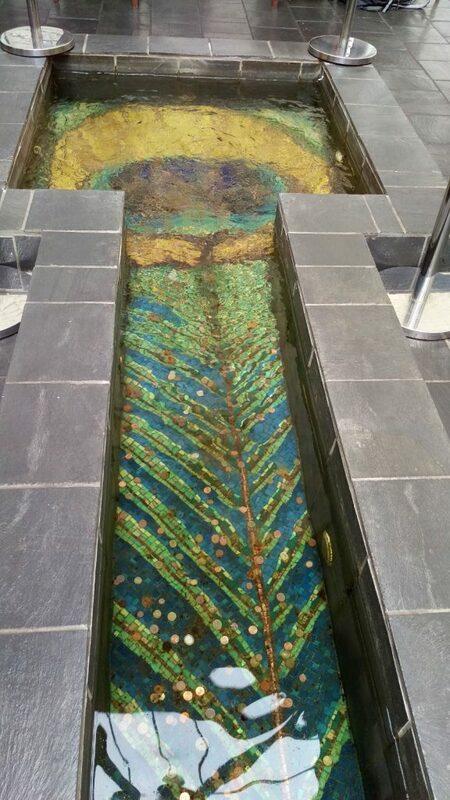 Beneath the main atrium of the Chester Beatty a reflecting pool leads, in my books, to the world of the Sídhe. But today the library staff frown on people trying to enter that way. Leaving Dublin castle by the gate on Palace street, under the façade of the Sick and Indigent Roomkeepers society building and little Dame lane to your right, you turn right onto Dame Street (specially widened by the Commission) and walk towards the main gate of Trinity. Where Dame Street becomes College Green you’ll find an architectural oddity known as the Tiny Building. 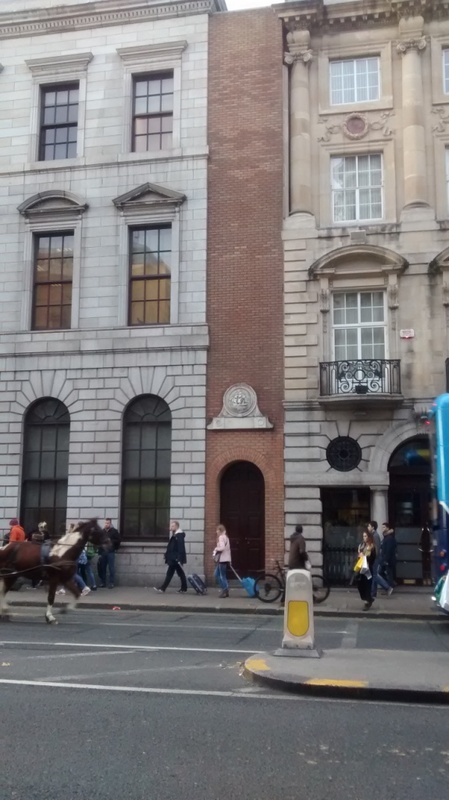 A building on College Green/Dame Street sandwiched between two others. Just a door, a strip of red brick and a white plaque depicting a ship. The Commercial buildings next door were rebuilt when the new Central Bank was constructed in 1980 and turned on a right angle which may account for the Tiny Building, but the truth has been very hard to track down. Dublin mysteries like it that way. The plaque commemorates the Ouzel Galley, which sailed from Dublin in 1695 only to vanish, presumed lost at sea. The crew were declared dead and the insurance paid. In 1700 the ship and crew returned, with tales of being enslaved by pirates and weighed down with booty, causing many to believe they hadn’t been enslaved at all but had turned to piracy themselves. Chaos ensued as insurers and investors clamoured for possession of the cargo, but in the end the same panel of merchants who had declared it lost, decreed that once creditors and insurers were paid the money remaining should be used for the good of the city poor. The Ouzel Galley Society became an arbitration society to deal with similar disputes. This odd little door leads, in my books, to a Sídhe safe space known as a Liberty. The Liberties is another area of Dublin, located elsewhere in the city, but once there were a number of areas known as Liberties which were manorial jurisdictions under Archbishops, Abbeys and Earls, where special laws applied. The first Charter of Liberties was written by Prince John of Robin Hood fame, then Lord of Ireland in 1192. One of the things which attracted me to writing urban fantasy set in Dublin is the city itself, the way things seem to shift and move of their own volition. The city is like a living, breathing thing, hiding parts of itself, revealing other, older places when you least expect it. With more than a thousand years of history to draw on, with myths and legends forming part of its fabric, urban legends are rife and seem to fit here. The Irish are good at stories. We live and breathe them. You can’t just tell someone “I went from a to b”. There has to be a tale involved. We need the sights and sounds, the smells, the things that make a story spring to life. (Dublin excels at sights, sounds and smells!) It is such tales that Dubh Linn, and Dublin itself, are built upon. Dublin demands to be a character in its own right in any tale that leads the reader along its grimy cobbles or wide avenues. 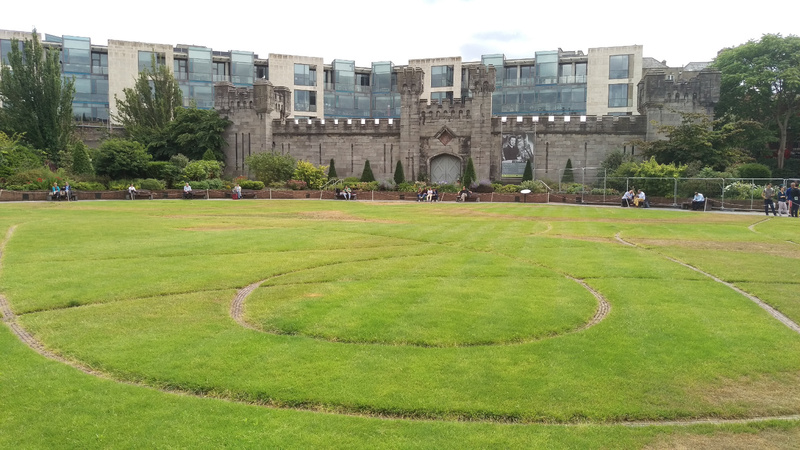 From Dublin Castle and the gardens that can now be found on the site of the original black pool that gives Dubh Linn its name, along the narrow winding roads of Viking and medieval Dublin, across the wide avenues of Georgian Dublin and into our modern plazas with their gleaming towers of glass, there’s so much to explore. Just don’t take the wrong turn. 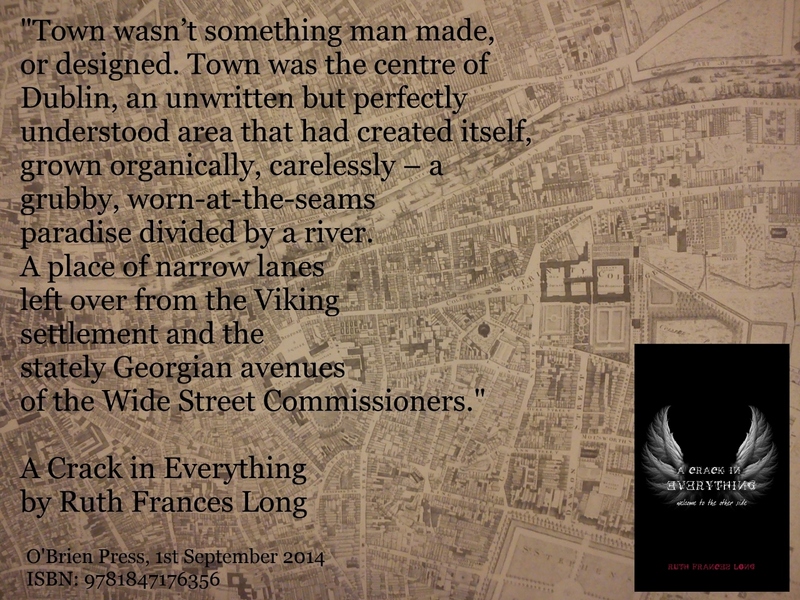 Ruth will be back with more of Dublin’s art, architecture and secrets. Ruth Frances Long writes dark young adult fantasy, often about scary fairies, such as The Treachery of Beautiful Things, and the Dubh Linn trilogy A Crack in Everything, A Hollow in the Hills and A Darkness at the End. (O’Brien Press, 2016). As R. F. Long, she also writes fantasy and paranormal romance. As Jessica Thorne she writes commercial fantasy/Space Opera. The first book in the series is The Queen’s Wing (Bookouture, 2018), with a sequel to follow in early 2019.